Former Portland Trail Blazers forward Clifford Robinson has had an active post-NBA career. He was on the hit reality show Survivor, where he finished 14th and was the fifth player to be voted off the show that season. He was a part of a team assembled by Dennis Rodman to go to North Korea and play the North Korean National Team in celebration of Kim Jong-un’s birthday in 2014. Now he wants to enter the next phase of his post-playing career. The Detroit Free Presstells us Robinson, 49, is now a marijuana advocate and will be a speaker at the Cannabis Collaborative Conference in early February in Portland, Oregon. He also plans to begin a grow operation in Oregon later this year and is calling himself “Uncle Spliffy” — a play on his ‘Uncle Cliffy’ nickname. Nowadays, Robinson, 49, is promoting marijuana, and will be a feature speaker at the Cannabis Collaborative Conference on Feb. 3-4 in Portland, Ore., where Robinson played for the Trail Blazers from 1989-97. Here’s Robinson discussing his new venture and his interest in cannabis. Once a Blazer always a Blazer, you know? Robinson was arrested for a DUI and marijuana possession in 2001. That earned him a one-game suspension while playing for the Phoenix Suns. As a member of the Golden State Warriors in 2005, he was suspended five games for violating the league’s anti-drug policy and another five games in 2006, as a member of the New Jersey Nets, for the same thing. 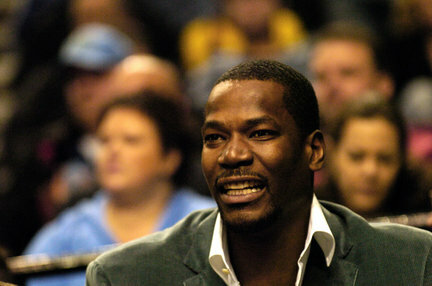 Robinson was a member of the Portland Trail Blazers for the first eight years of his 18-year NBA career.